Do you feel most comfortable at places where others do no longer think about bicycling? Preferably, are you cycling through the country and climbing the steepest slopes, subsequently crashing down adventurous trails? In that case we recommend a mountain bike from Senglar that performs well in extreme situations. For the 2015 season, you will find your pedelec for pure riding fun in difficult terrain in our program. We offer lightweight and sturdy mountain bikes which consist exclusively of high quality components. The bicycle forks used from Rock Shox are reference products on the suspension sector and you prepare your mountain bike pedelec with the lockout-function for use on asphalt just at the touch of a button. 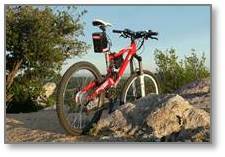 The electric bike for uncompromising application in difficult terrain weights only 18.8 kg. If you want to fly high high with your pedelec in 2015, you should buy your pedelec at Senglar! The small, lightweight but powerful hub motor with 250 watt supports your pedelec during steep climbs together with a battery pack of 418 and 489 Wh. Depending on route profile and driver assistance the motor achieves approximately 80 to 95 kilometers with a single battery charge. You can choose your electrical bike from different frame sizes, colors and types of batteries. We will build your lightweight pedelec according to your wishes and requirements. Have a look at the different Senglar-Models and find your new pedelec that meets your wishes. Our Senglar Pedelec Trekking is the ideal choice for extensive bike tours. You will have a lot of fun cycling over hills and dales with Senglar Pedelec Mountain Bike. The small, lightweight Senglar Pedelec Cross is extremely versatile. Senglar is the expert for new electric bikes and also for conversion kits for pedelecs. In 2015 with a first-class e-bike to new sportive highlights.